DAVID P. ZAYLOR age 80, beloved husband of Catherine (nee Solli) of 57 years; loving father of Andrea (Rob) Cook, Damon (Meghan) of Park City, UT and Darren (Kellie) of Camarillo, CA; dear Papa to Grant, Cole and Vivienne; brother of the late Pamela Novak (Wesley); dear uncle and great-uncle. 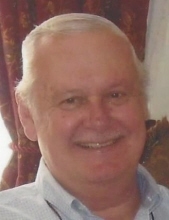 David was a science teacher at Rocky River Middle School for 31 years, served as the treasurer for the Rocky River Schools Credit Union for 47 years and was the superintendent at Lakewood Park Cemetery for 11 years. Passed away Monday, March 25, 2019. Funeral Mass, St. Bernadette Church (2256 Clague Rd., Westlake) Saturday, March 30 at 10:30 AM. Private interment Lakewood Park Cemetery. Friends may call at the McGORRAY-HANNA FUNERAL HOME OF WESTLAKE, 25620 Center Ridge Rd. West of Columbia) FRIDAY from 3-7 PM. "Email Address" would like to share the life celebration of DAVID P. ZAYLOR. Click on the "link" to go to share a favorite memory or leave a condolence message for the family.